This homemade dish soap is made with simple, non-toxic ingredients. UPDATE: I have since stopped using this dish soap recipe. It is way too finicky and inconsistent, and it just wasn’t worth the time or effort anymore. 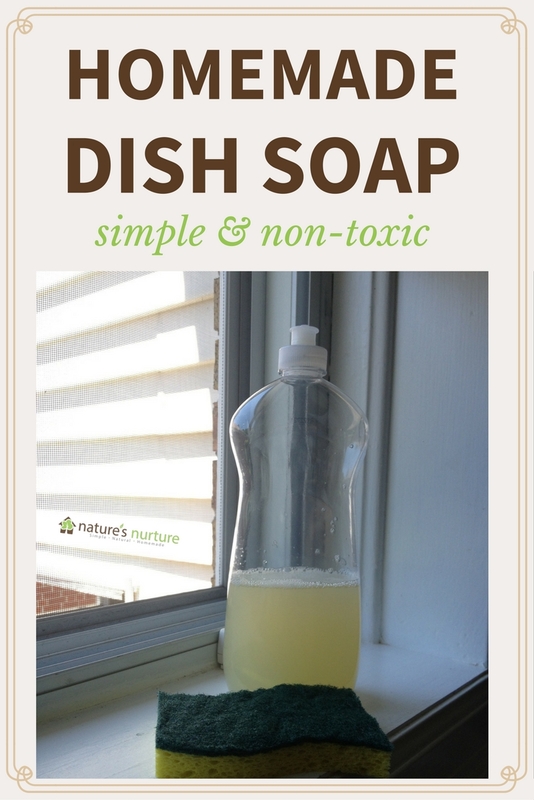 I now use a natural, non-toxic dish soap from Nature Clean (Canadian company), but have also used Seventh Generation, and even Sal Suds with great results! The dishes never end. Ever. Why is that? What kind of ridiculous law of physics has mandated that the dishes never end?! You’ve worked so hard, diligently washing, scrubbing, and rinsing every dish, cup, and utensil that’s scattered in and around your sink. You’ve scrubbed the sink, dried the counters, wiped down the faucet, and your sink is looking pretty darn hot right now, am I right? That moment that catches you completely off guard and makes you want to go crawl into a corner, assume the fetal position, and rock yourself back and forth, assuring yourself that everything will be ok.
That moment that gets you to throw your dish gloves in the air, mutter something to the tune of, “arghh, forget this!” and just crack open that pint of ice cream you hide in the back of the freezer, because darn it – you’ve earned that ice cream! But they don’t stay there for long, because as soon as you’re done eating that ice cream straight out of the tub (shhh, I won’t tell…), you’re going back for those little buggers. Each and every one, until you’ve won this dishwashing war once and for all! …and then it starts all over again. Because, of course, the dishes never end! And I don’t use a dishwasher. I don’t even know why, really. It started because I just couldn’t justify running a whole dishwasher for the fairly minimal dishes we were generating as a family of three. But then we became four. And now we’re five. And you know what? Those dishes are starting to add up. But I still can’t get myself to open that dishwasher and load it up everyday. Maybe it’s not the dishwasher I have a problem with. Maybe it’s the idea of letting all the dishes just sit there and accumulate in the sink all day until it’s finally enough to fill the dishwasher? I don’t know… Either way, it’s still hand washing for us around here. I’ve attempted (and failed) my fair share of homemade dish soap recipes. Every single recipe I’ve tried just kept falling short. It didn’t suds enough (I know suds isn’t a sign of clean, but it was more than that – it just didn’t work! ), or it wasn’t soapy or slippery enough, or worse – it left a nasty film on my dishes. There are lots of factors at play of course (type of soap, water hardness, etc.) so I’m not saying that those recipes didn’t work – just that they didn’t work for me. So when I came across this recipe by Jerica from Sustain, Create, and Flow, I was a bit apprehensive at first. But then I read the post in its entirety, including all of the comments, and felt very optimistic. Let me tell you first that I’ve tried just diluting Dr. Bronner’s liquid castile soap to use as a dish soap, and although it kind of got the job done, “kind of” just wasn’t enough for me. I love Dr. Bronner’s soaps for so many things but a simple dilution just wasn’t cutting it this tme. In great part it’s due to the fact that vinegar is an acid and the castile soap is a base. They will directly react with each other and cancel each other out. So, instead of getting the best of both (the scum cutting ability of the vinegar and the dirt transporting ability of the soap), you’ll be getting the worst of something entirely new. The vinegar “unsaponifies” the soap, by which I mean that the vinegar takes the soap and reduces it back out to its original oils. So you end up with an oily, curdled, whitish mess. And this would be all over whatever it was you were trying to clean – your laundry or counters or dishes or whatever. 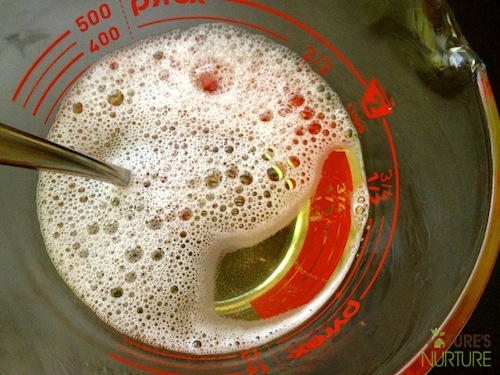 Let’s make some homemade dish soap! For this homemade dish soap recipe, all you need is some grated bar soap, liquid castile soap, washing soda, and some (optional) essential oils. I used Dr. Bronner’s baby mild bar soap and liquid soap. 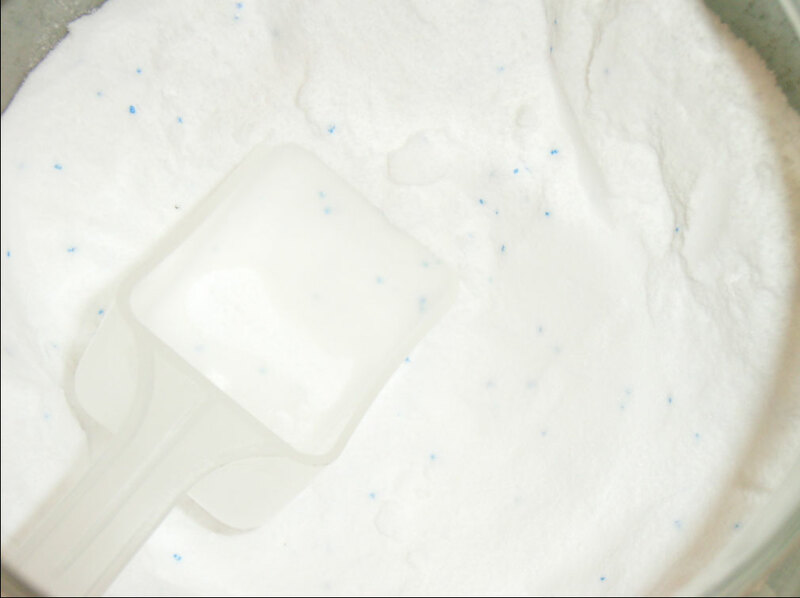 Washing soda (NOT the same as baking soda) can be found in your laundry aisle near the Borax. It’s in a bright yellow box, but if you can’t find it locally, you can either purchase it online at Amazon, or try making your own from some baking soda. I used orange and tea tree essential oils because I love the smell of citrus in the kitchen and the tea tree is anti-bacterial, but you can experiment with all sorts of fun scent combinations! You’ll just mix the grated soap flakes with some boiling water and stir. 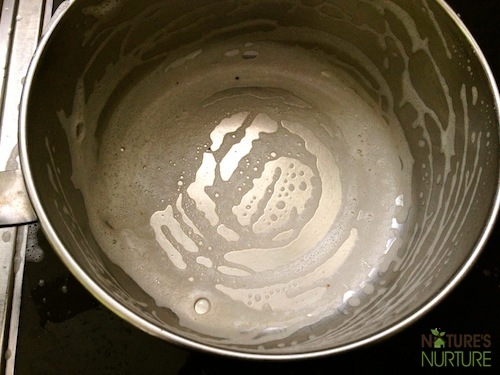 Once the soap is dissolved, you’ll add the washing soda and stir, then add the liquid castile soap and stir. Once the mixture has cooled, you can add your essential oils, then transfer the mixture to a repurposed container (an old dish soap bottle works great!). Jerica even has a neat tutorial on how to turn a mason jar into a soap dispenser (then you can just make up the batch right in the jar!). Well, this stuff works! It looks, acts, and feels like a real dish soap – it bubbles up nicely, cleans very well, and rinses away with no nasty film or residue. It starts out very liquidy but it thickens up as it sets. The first day it was completely clear like the photo at the beginning of this post, and by the next day it had become a thick, white product. But I just shook it up real well and it loosened right up and was more gel-like, which totally works for me. If it’s too thick to shake up, I just add a little warm water, give it a good shake and it’s good to go. Since not all kitchens or water systems are the same, your soap may behave a little differently depending on the temperature of your kitchen and the hardness of your water. You can play around with the amount of washing soda in the recipe until you find an amount that works best for you. Important Note on Dishwashing Method: I just wash my dishes with a wet sponge and soap – meaning that I don’t fill the sink with water and let the dishes soak. The soap has great suds on the sponge, but I have to make sure I don’t add more water to the sponge after I’ve put soap on it because then the soap starts to lose its suds. So I can imagine that using this soap with the soaking method probably wouldn’t work very well. What’s one homemade product that you’ve attempted and failed at a few times before finally finding “the one”? I made a batch of this yesterday – thanks for the simple, clear instructions! It cooled nicely and the consistency seemed perfect, but today I noticed it separated. Any thoughts on what I might have done wrong and/or how to fix it? You didn’t do anything wrong. It’s a finicky recipe, as I pointed out in the notes. Just give it a good shake and it will be fine. I’m just wondering what’s the purpose behind using the castile soap bar & the castile liquid soap together? Thank you. It can be any bar soap (not necessarily Castile). But the bar soap keeps the cost down, and the liquid soap provides enough water content. I love this! Do you know a recipe for a dish soap bar? I crochet dish scrubbies and wanted to put soap bars inside–you know, for when you have just that one pot that needs scrubbing and you don’t want to fill it with all soapy water, you just want to scrub it with preloaded soap scrubbies? (They make those–pre-soaped scrubbies for pots and stuff.) This way we could have a natural version instead of using so much dish soap. Oh my, no I don’t, but that sounds very interesting! Hi, why is the castile soap grated? Can i skip that? What is a good substitite for liquid castille soap? Im using a coconut oil based soap. Hi! I am trying to make a dish detergent soap that will help with cleaning my travel coffee mugs! Most dish soaps ruin the taste of the travel coffee mugs and I wanted to try my hand at making a soap with coffee! I wanted to hear your thoughts on using this same recipe but instead of essential oils like the Tea Tree and Orange, I wanted to try a coffee essential oil. I found one on Amazon that I will copy and paste to here. Do you think by incorporating the coffee essential oil that this would help with the weird soap taste that ruins the travel mugs? I know some people don’t actually wash their mugs to keep the taste of the coffee normal but I can’t not wash mine! First of all, what a brilliant idea! I never would have thought of this haha. That being said, I would totally try it, I’m just not sure it would be strong enough to overtake the soap taste. But again, I would probably cut the recipe in half, or even less, just to try this. Is your coffee mug plastic? A stainless steel mug shouldn’t be affected by dish soap. I hope I don’t sound ignorant, but do the essential oils need to be food grade or can they be aromatherapy? Not ignorant at all, Ruth! Just make sure you’re using 100% pure essential oils, not something labeled as “fragrance oils” etc. Can this soap (because of the baking soda) be used on aluminum baking pans? I don’t have aluminum pans, so I had to go research this baking soda issue – I learned something new! That being said, this recipe uses washing soda, which is a little different from baking soda, but after a little more research it looks like you should NOT use washing soda on your aluminum pans either. I like to use sal suds for my dish soap since it’s excellent at grease cutting and nothing works quite as well as sal! I used thjs recipe today for the first time and it came out really thin like soapy water. I would like it a little thicker. Do you have any suggestions? I love how it makes my hands feel. It also worked really well on my floor as i spilled a container. Depending on several factors (water hardness, the washing soda amount, etc.) it usually tends to harden over time. If you have softer water, that might be why it’s not hardening. In that case, you can increase the washing soda amount just a bit to see if that helps. I have always been interested in natural products and I will be trying out some of what I see here. I live in the Caribbean and it is a bit difficult to get some of the products such as Borax, but recently I checked many places for it and finally got it at an Industrial supply store. I think that many persons are not interested in Greener Products. I will do the best I can. This site has so much stuff which make sense. Thank you. Do the best you can with what you’ve got. Great work, Mirthlyn! Very informative but I live in a part of world where liquid soap can’t be found. Do you think I can substitute it for something else to make my own dishwashing liquid? Hmm, you might be able to use a bar of soap and shred it, then melt it down in some boiling water to create a liquid soap. But it would have to be heavily diluted in order for it not to become solid again once it cools down. Is it not cutting the grease, what can I do add to it? Folks earlier in the thread state that washing soda acts as both degreaser and water softener. The OP also just lathers up her sponge then rubs her dishes, she doesn’t put a squirt of liquid soap into pan of water to soak dishes. Hope that improves your experience. Hi, I used this recipe but the soap was so thick and stick together, no matter how much extra water I add to it. What did I do wrong? You might need to adjust the amount of washing soda you use. In regard to cost vs. store bought, you never know what you are getting with store bought. First of all, the large manufacturer’s source out many supplied form China with no idea that the supplies may be contaminated. Also, the law allows you to say your product is “All Natural” even if it is not. Manufacturer’s can call a product all natural and list proprietary artificial ingredients simply as “fragrance.” They don’t have to list artificial preservatives at all and can still call their product all natural. The worst form of mis-information is when they list 99% natural. Since most soaps and especially creams are 99% water, this is an easy claim even if all other ingredients are not natural. My formula for dish soap is the same as listed here, except I add a drop of Wild Oil of Oregano as a natural preservative and antifungal. My only problem with homemade dish soap is that it is so damn thin and watery. Hi! I’m researching for our local food pantry and social services organization about home made cleaners, especially those that can be made on a budget, or almost entirely with food stamps. I made the washing soda from baking soda following instructions I found on another site, and it worked really well for me. Since I am trying to get these things to work on a budget, I am a bit limited to the products I can use. 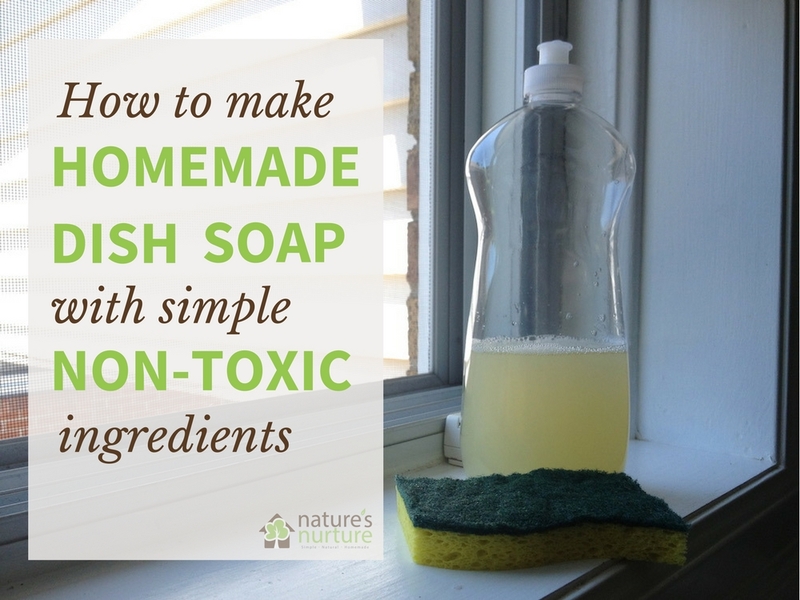 I found some natural soap at a local dollar store ,packaged at 3 for $1, and used that in this recipe, along with the “homemade” washing soda and fresh lemon juice and pure lemon extract from the baking aisle. I am making mine in a big batch (using a whole bar of soap) because I want to give samples of it to the people I am reporting to. I am in the process of letting it set and then will try it out. So far, it looks like I am going to be able to make a bottle of dish soap that actually works for around 9 cents cash, and less than 75 cents of food stamp products. I am eager to show our community that this is a viable option! Hey Stephanie, this sounds so awesome! I’m very curious to know how the dish soap turned out, using the dollar store soap. 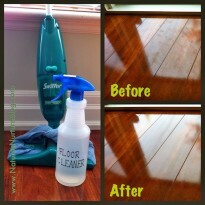 Also, homemade cleaners is totally my thing! 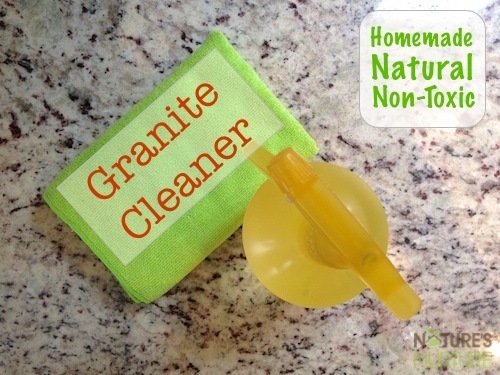 So I invite you to check out the posts in our cleaning category here: http://naturesnurtureblog.com/category/household-cleaning/ and let us know if you need help with anything. Best of luck to you! Hey Marie, I haven’t tried it with just one or the other. I do know that the ingredients in the liquid and bar soap are different – the bar soap uses ingredients that make it harder and only has about 5% water, whereas the liquid is about 60% water. According to this article from Lisa Bronner, 1 cup of the liquid is equal to about 2/3 of the bar. So by that calculation, the 1/4 cup of grated bar (which is somewhere between 1/4 to 1/3 of the bar) should be somewhere between 1/3 and 1/2 cup of liquid. I’d start out with 1/3 cup of extra liquid soap and see how that works out. So if you’re adding 1/3 cup to the initial 1/4 cup of liquid soap called for in the recipe, you’d end up with 7/12 (if my memory of algebra serves me correctly, lol), so that’s about 1/2 cup total of liquid soap, while omitting the bar soap completely. If you’re omitting the bar soap then you won’t have the problem of the dish soap getting hard. You’ll still want to add the washing soda as it works as a degreaser and water softener. Hope that helps and let us know how it works for you! I just wanted to say THANKS for sharing such a wonderful DIY recipe. I used to feel the same as you, when diluting liquid castile soap which was… just ok. I settled for that for a long time because I knew that this was still a better option than using the chemical-laden alternatives. My major complaint was the film that was left on the dishes and on my counters. I followed your recipe to a T except for the washing soda, because I like the soap to feel more like a gel, so I used 2 tbsp instead of 1. Next batch I’ll use only one, because the dispenser gets a little clogged with the current mix. I wanted to share this with you and your followers. I’m very grateful for your post. Thank you for sharing the good stuff : ) I look forward to learning more from you and your natural lifestyle ; ) Bless. Thanks for this recipe. Quick question: Why is there a need to use both castile bar soap and castile liquid soap? Aren’t they the same just that one in liquid form another in solid form? I just made this soap and couldn’t wait till it cooled!! So I washed my dishes and I love t!!!! Now we will wait and see how well the kids like using it 🙂 I made mine with the lemon citrus Dr. Bronner’s and the Kirk’s original castile bar soap and my kitchen smells fantastic ☺. Reading all the comments of so many different recipes including this one is what helped me choose which one to try. Thank you so much for the time you took to make this available for us to try. I was wondering about the acidity of essential oils, like, would it interfere with the castile soap if I used grapefruit essential oil, or lemon? Or are they not acidic? I’ve used orange essential oil without a problem. Any time you add water to a homemade recipe you need to add a preservative to keep bacteria from growing. Even if you use distilled water? ESPECIALLY if you use distilled water, because it’s not chlorinated. However, I doubt the recipes discussed in this thread will need preservatives, because people mention having to stir it to keep it from jelling hard. That implies that its water activity is low enough that it’ll probably self-preserve. I mean, not that it can’t spoil — jelly in a jar can still get moldy — but it seems like you people aren’t keeping it around long enough to do so anyway. I used water, liquid castile soap (dr bronners), arrowroot powder, lemon juice, and citrusy essential oils. I just tested it on a few dishes and it seems to work great! It suds a lil which is nice but I’ve been using all natural soap for a while so I don’t mind the lack of bubbles haha. Also, I read somewhere that lemon juice can help cut grease so that’s why I added it. So far, so good! I just noticed people have a problem with it turning into jello…..cute idea use little silicone molds and make little jelly soap packs!!! That actually is pretty cute! I used a recipe similar to this one I used borax and ivory. I hate it, everything is greasy. The ivory separates in the water floats to the top and leaves scum flakes all over everything. I hate having to start over. I may just go get a big bottle of dawn. It is my favorite and it is natural as well I believe. They use it to clean oil off of animals when there is an oil spill so it must be ok. Also they pour it in the water around oil spills to clean them up. Suppodildly! You’d think that the ingredients used in baby products would be super healthy too, but think again! That’s mostly the whole idea behind making products ourselves. We can’t trust the manufacturers to keep us healthy and safe, we need to make sure of that ourselves. That’s why it’s a good idea to always check the ingredients of the products we use. If we don’t know what one or all of them are or what they mean, it’s time to start researching them. Some people make their own products because they or their faimily can’t use the chemical laden ones. Others decide that they’d rather not expose themselves or their family to those chemicals after learning the facts. Everyone is on their own journey for different reasons. Whatever the reasons, it’s nice to have others to help us out along the way. It’s best to remember also, that Rome wasn’t built in a day. Taking baby steps in this process is a sanity saver for sure, have patience with ourselves as well as others, and have fun along the way! Thanks for the recipe…I had two problems that others had. Mine turned really gelatinous (pretty much solid) so I watered it down by more than half the next day and just added in the liquid castile soap and half the wash soda. It probably cleans fine but doesn’t suds so I just grated some bar castile and added a pinch. What do you know…suds! It’s a bit more trouble, though. I wondered why not just grate the bar soap and mix in the soda and add a pinch to your hot dish water? This would save several steps. Does it need the liquid castile? Thanks! Tried this recipe. Did not work. Residue and spots noted on my glassware and stainless steel sink. Would like to find something that is at least close to the commercial brands.Any suggestions? I’m so sorry it didn’t work for you, Kat. The recipe seems to be very dependent on your water type, as castile soap doesn’t do very well with hard water. Think that may be the case? Hi there, this recipe worked well for cleaning but seemed to thicken up like the consistency of egg drop soup. I used my immersion blender for about thirty seconds and it seemed to solve the problem. Consistent, a little foamier, and much more scent!! Thanks! Think its important to understand that there is a difference between “soap” and detergent. Detergents came into daily life after WWII. And liquid detergents for dishwashing not long after. Before the war, powdered bar soap, and soap flakes were used for dishwashing, and laundry.They were Eco friendly and didn’t know it! However, and this is a big however, they were commercially made soaps, and specifically made for dishwashing, and laundry. Not to take a bath with. Bath soap normally has extra fat added, or unreacted oil contained therein to be conditioning to skin. To be effective for dish, or laundry use, the soap has to be made without extra oil! After all that’s what we are trying to get rid of when doing dishes, or laundry! Dr Bs and Kirks have this extra oil. So dose Ivory. This is why so many are having trouble with a greasy feel on the dishes, no suds, ect. If you can find a “pure” soap thats made for the specific purpose of household cleaning, not to take a bath with, you’ll immediately see the difference. Look for a soap that has what sometimes is refured to as having a 0% super fat! (No extra oil) This is what was used before detergents came along. And don’t add vinigar. When using soap, for the reasons mentioned above by Samual, it deactivates the soap. Actually “detergent” just means “cleaner”, without reference to its chemical makeup. So if you’re using soap to clean with, it’s technically a detergent too. The distinction between laundry and bath soaps was never as great as you think. Ivory soap was sold for both purposes; the twin cake’s slogan was “one for kitchen, one for bath”, and you’d break the 7-oz. bar into 2 cakes, so obviously the same composition was in both; it’s not superfatted. Most other toilet soaps aren’t superfatted either, or are superfatted so lightly that you can easily still use them for laundry & dishwashing. However, there’s a distinction between “soap powder” and “powdered soap”, in that soap powder commonly included a small amount of alkali, such as the washing soda discussed in this thread — although the right kind of sodium silicate was better in combination with soap. “Powdered soap” is just that. However, Boraxo powdered hand soap actually contains more borax than it does soap. The cheaper soap powders contained more of the alkali; the ones for delicate fabrics, such as Ivory or Lux, had no added alkali. 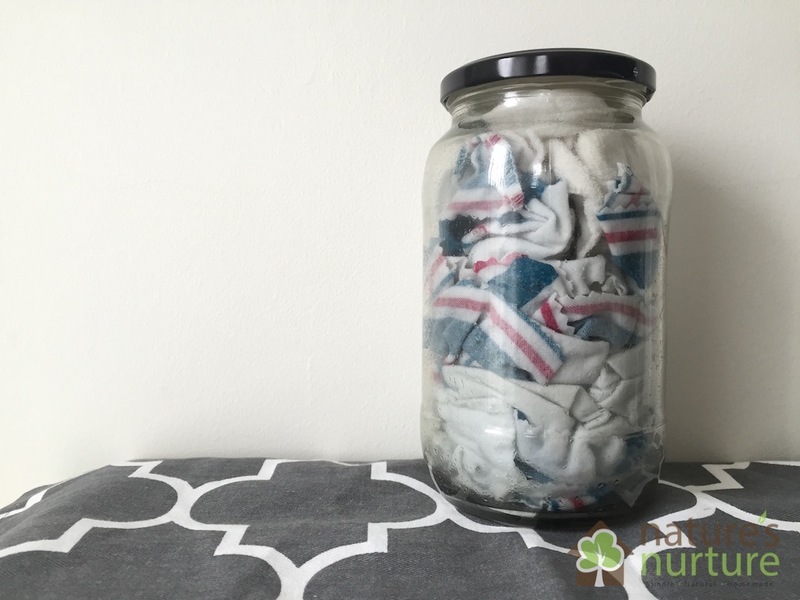 The recipes that’ve been going around on the nets in recent years for homemade laundry detergent universally call for far too much in the way of alkali (washing soda and/or borax) to make a quality product. That’s why they’re so cheap-seeming. If they called for as much soap per use as a good formula would, they’d cost about as much as store-bought detergents, and they’d be too sudsy for HE machines. 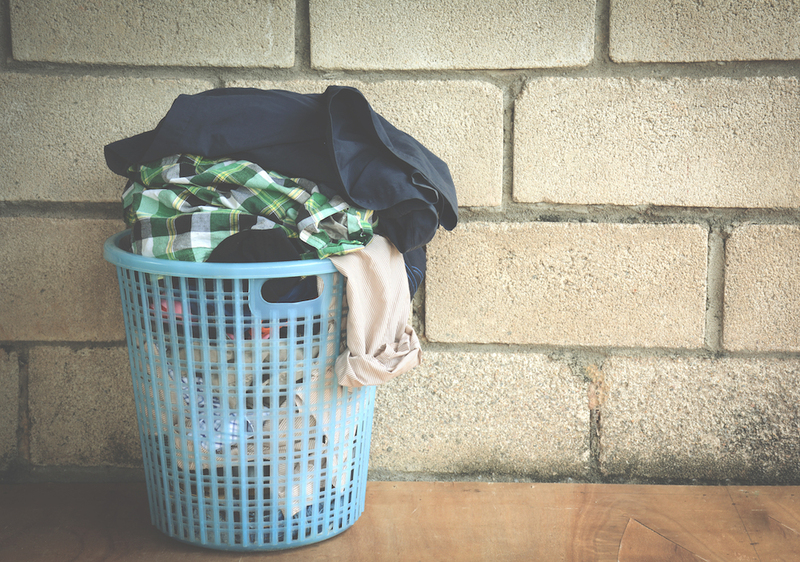 The only reason people aren’t seeing rapid fabric wear when washing with these home recipes is that many of them call for using so little per load that effectively they’re doing nothing but deodorizing the fabrics by neutralizing stinky acids. Unfortunately Seventh Generation has palm oil in it as well. They label it sustainable, but from all my research there really is no such thing. Pre- existing palm oil farms are only good for 50 years. In general when looking for the ingredients on making soap, don’t buy anything that has cetyl alcohol, any kind of stearate, or sodium lauryl sulphate in it, its another name for palm oil.. Vegetable oil is suspect as well. It’a a generic name. Anything containing palm as part of the word is a no go. You try to go natural,organic, non GMO, then run into this problem. All my research so far on soaps, dishwashing etc, only lists Australian products with no online US shipping. If anyone knows something please let me know. I’m reading this blog a bit late but I came across it looking for dishwashing liquid without palm oil ingredients. I’ve had exactly the same results like you did, Aida. Great products out there – if one happens to live in Australia. Seventh Generation uses RSDO-certified palm oil which means not much, it’s a promise on paper, still destroys forests and wildlife. Dr. Bronner uses true sustainable palm oil from small farms in Africa, as does Alaffia products. But both don’t make dish soap. I tried Dr. Bronner’s but it leaves too much grease (and I have to admit I don’t have much patience in mixing receipes). The one company I haven’t researched yet is Begley’s Best from Ed Begley. Dr Bronner Castile soap has palm oil in it for foaming lathering.That’s probably why it works so well It’s contributing to destroying the rain forests through the ever increasing slash and burn palm oil plantations in Indonesia and South America. Orangutans are going extinct at a alarming rate. The Rain Forests are also lungs for the planet. You should read how they obtain their palm oil, it is not through slash and burn methods. Dr. Bronner’s is one of the few companies I trust. So it’s a little cheaper than most natural dish soaps. If you have a few minutes and really care about what goes in your soap, I think this would be great! Thanks for the cost breakdown, Hannah! I chuckled every time your response came up! Well, you got MY attention and I have just two questions…first, where can I find a coconut laundry bar and secondly, will you share your ‘homemade lard’ recipe with me…never made it and have no clue what’s in it!!! But I am so willing to try it!!! Would using distiller water resolve the problem with hard or soft water? I don’t know what I did wrong. I made this twice and both times it turned into a lumpy, gloppy mess! I used less washing soda the second time and it didn’t make much of a difference. Also, it didn’t suds up at all and doesn’t seem to do a very good job on the dishes. Doggone it!! Can you use fels-naptha bar soap for this recipe? Thanks! I’m not entirely sure, but if you try it let me know how it goes! I have the too thick problem, I add water and it is still too thick, what did do wrong? Try reducing the washing soda? Or maybe increasing the liquid soap a bit? Do you have an estimated shelf life for this recipe? I was considering making it in bulk since that’s what I do with laundry soap, cleaner, etc, but I want to make sure it will keep well first. No sense in wasting! Not sure about shelf life, but I know if it sits for too long, it’ll just turn into a solid block, which is why it needs to be shaken everyday. I wouldn’t make it in bulk for that reason. I’m still working on perfecting it, so I’ll keep the idea of bulk batches in mind as I continue to experiment! Thanks! If I’m using such a small amount in such a high dilution like this, I don’t really worry about it and I’ve never had any issues. However, some folks like to make sure to always use glass no matter what, so it’s really up to you. Can i use lux soap flakes instead of castle? I am a massage therapist and i’m looking for a hand soap that’ll take the oil off of my hands in between massages. Would this work as a hand soap by chance? For those of you getting oily-ish streaks using the homemade dishwashing soap – it could be your water. If you have a city supply, the amount and kind of chemicals in it bounces up and down as the water authorities add stuff to kill germs, remove colors and odors, etc. And I have heard that adding vinegar (acid) to your hoemmade mix will neutralize the soap (alkaline) so don’t do that. Hi there! This looks awesome, though is there a way to use all liquid soap? I quartered the batch because I wanted to make a bit to see for myself if it worked and it doesn’t bubble or foam or anything. Any suggestions? Hmm, a quarter of the batch seems a bit small I think. What is that, like a tablespoon of each of the soaps? I’m not sure, but it just seems a bit small to be able to properly test. I’m sorry I don’t have any suggestions, because I’ve never had a batch that didn’t bubble or foam. So I’m thinking it may be that the amount of soap in the quarter batch is just not enough to work properly. I made the whole recipe. It bubbled while I was filling the sink, but the suds went away immediately. We do have hard water here, but I was really hoping for suds. a sure thing for cutting grease and a sink full of bubbles…1 heaping tbsp of grated homemade lard and coconut laundry bar soap. A quarter of the recipe, a third, a half, whatever, it SHOULD work regardless when you only use a very small amount when washing dishes. Perhaps this recipe just doesn’t work like you claim it does because I did a full recipe, following it exactly, and guess what? It didn’t work! Any suds, die instantly and I’m left with a sink full of cloudy water. Very disappointing given your assurances that you’d finally found a recipe that worked. I’m sorry it didn’t work for you, Jodie. Although, if I understand your comment correctly, it seems like you are trying to use this recipe with a sink full of water to wash the dishes? Please correct me if I’m wrong, but if that’s the case, I’ve already addressed this issue at the end of my post (in a note right above the printable recipe), and tried to make it clear that this recipe probably wouldn’t work very well if you wash your dishes using the soaking method. I just apply the detergent to a wet sponge and scrub the dishes that way – with that method, the dish soap works almost perfectly. Suds do not imply its cleaning, or not cleaning….Suds are not a sign you have made usable soap….Its all about the chemistry of your soap and dishwater…….Again, suds or lack of dont mean its working or not working….My laundry and dish soap do not suds up but wash very well…. I added the zest of a lemon and some dried mint to the boil and it worked out great. And if you use Kirk’s Castile, it’s about a third the cost of Dr. B’s. LOL @ making dishsoap. All you are doing is just mixing soaps or cleaners together. I hardly call that making Soap. Making Soap is when you start out with OIL_Fats and convert it to soap using a strong base. Normally Lye for hard soaps and potassium hydroxide for soft soaps like dish soap. And yes.. anyone who mixing vinegar in soaps that are made from Fats-oils are doing a big no no!!!!!!!!!!!!!!!!!!!!.. You must never mix any acid with any soap made from fats or oils. What this does is convert it to FFA Free-fatty-Acid. This is not soap. 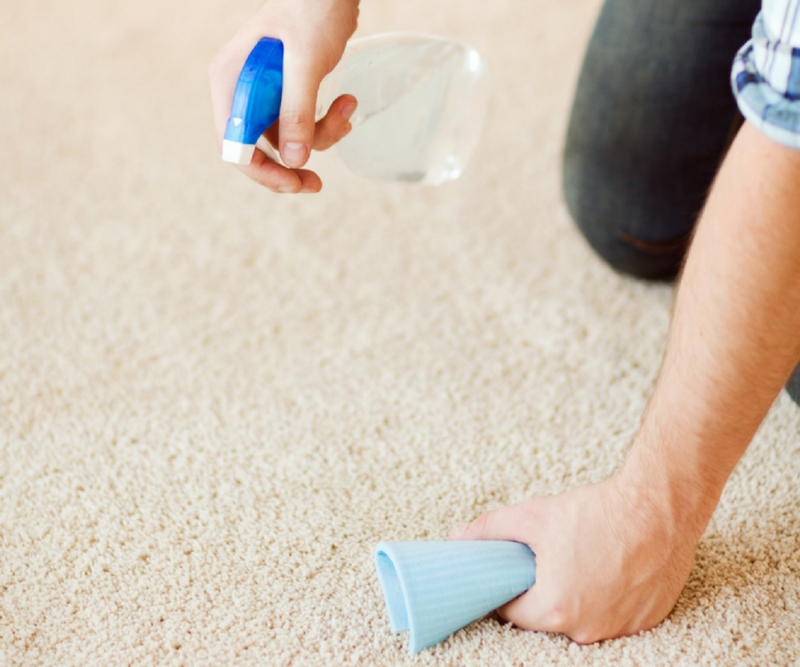 its an oily based substance that will not clean anything and it will stick to everything. The only good thing that FFA can be used for is turning it into Bio-diesel. So…do you have a recipe for dish soap that starts out with potassium hydroxide>? i love how simple this recipe is. the one question i have is…after washing my dishes, they come out oily. and when dry, it leaves water marks..
i’ve decreased the oils, and in one recipe i didnt use the oils. just the bar and liquid soap. and still have the same effect. Is it possible if you’re not using washing soda it could be due to that? washing soda is a degreaser and you’re not using it you’re not degreasing. I’ve found if i’m washing really oily surfaces, ex. coconut oil residue, it works best if i put a new squirt and work with that. and sometimes i have to double wash oily containers. other that that, i love the dish soap. no difference from 7th generation free & clear. and i have super super soft eggy water so i always have some spots on my dishes. no big. i’m just grateful i have a kitchen and dishes to eat off of, and soap to wash with. and more than one pot. One last thing- instead of using essential oil, i used a dr. bronner’s peppermint soap bar because it’s all target had. It has a lovely smell when i’m washing! sorry for the late reply, was on vacation. I followed the recipe using the washing soda as directed. Then i tried another batch, with less and then more washing soda. also did a batch with a little bit of borax. I think i do have hard water. with the batches i’ve made, the top gets hard, so i have to shake the bottle till everything is mixed….and its still oily. No, common salt won’t soften water. It will recharge a water softening unit, but it doesn’t work directly on the water. Maybe try adding vinegar to your rinse water… but NOT with your soapy water as it unsaponifies the oil in the soap. I personally don’t do this but I’ve heard vinegar makes an excellent rinsing agent. i just made some, it’s cooling right now! hopefully i’ll like this as much as 7th generation free & clear, which i’ve been using for years. to address the question of how much bar soap, i used dr. bronners peppermint bar soap, a 5 oz bar. i cut off about 1/4 of the bar to grate, but needed less than that. i put the extra grating and pieces back to use another time, and i spilled some gratings too, but overall i would estimate i used 1/5 of the bar for this recipe. probably even less. i hope this helps! 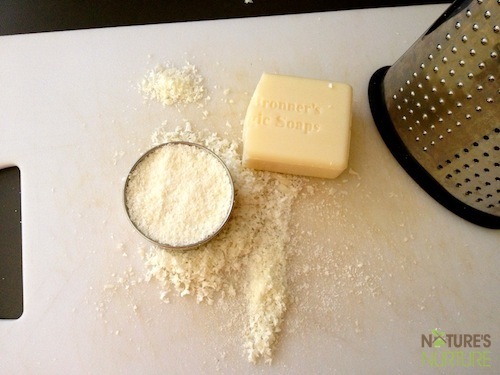 How much of the dr. bronners bar soap is 1/4 cup grated? half of the bar? one quarter? I grate a lot of soap at once in my food processor and just measure it from there, so I’m not really sure how much if the bar it is. It can’t be more than 1/4 of the bar though. I really need to measure it properly so I can do a price breakdown though! I just made the soap (haven’t tried it yet). It took about 1/4 bar to create 1/4 cup. I made this following the exact recipe. It works very well. It does not have a lot of suds but they are not necessary. I used Dr. B’s lavender soap (liquid and bar). Added some essential oil of lemon. I did not have the issue with it being too thick, I found the opposite and plan on adding more washing soda next time. Sarah I love your website and rely on it all the time. I have only recently switched over to the ‘natural’ side and I am loving it…again thanks to you and your website. I made dish soap before in a few different ways. However, I kept running into problems. Therefore, I almost thought I would never get to have homemade dish soap. Then one day I was really brainstorming about it and God said, “Why do you need to grate the soap and add anything?” It was an Epiphany. I took the natural coconut bar soap which is like a $1.?? ; put it in a dish, got my wet sponge,lathered it up and did some dishes. Wow! They were squeaky clean and it did everything I needed it to do. 1. Not have ingredients in the soap that I can’t pronounce and some article tells me it’s dangerous to the health of humans 2. Wash dishes squeaky clean. 3. not cost an arm and a leg. Now all I have left to perfect this experience is make my own coconut soap and I’m all homemade. The soap I buy is Kirk’s bar soap which is at walmart, and some grocery stores. However, it’s not at every Walmart. Although, I have found it at some grocery stores and other stores it’s simply either going to the store and seeing if they have it, cold calling the store and asking if they have it, researching their website ; where there is a will there is a way! I had to share! this sounds great. love that you heard from God for this idea. i just bought a few bars of kirk’s natural soap for the first time and have one sitting at my kitchen sink. i’m going to try using that bar of soap on the dishes too since i’ve just run out of dishwashing liquid. thanks! i am reporting back that i did try just using just the kirk’s castile soap to wash my dishes. they cleaned quite well but i’d get spots (like soap scum) on the dishes so it didn’t ending up working out as well as i’d liked. 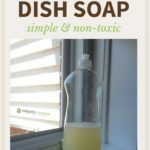 I have been looking for awhile to making my homemade liquid dish soap for awhile and I am not even going lie that same epiphany popped up in my mind as well. So I am going with it. I know a lady who make home made natural soap https://www.facebook.com/naturalbodytreatsLI , but I want to learn to make my own soap as well. Will report my experience later. Thank You & God Bless You. Yeah, I have the same thickening issue as well, and I just a tiny bit of warm water to it, shake it up real well, and it’s good to go. I do this quite often since my kitchen stays pretty cool and it hasn’t compromised the strength of the soap at all. You could try decreasing the washing soda (not sure about eliminating it, but if all else fails, I’d try that as well). 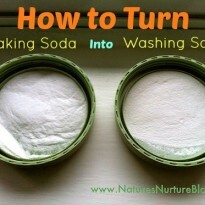 I’ve seen some recipes use borax instead of washing soda, although I haven’t tried it. Like with most homemade cleaners, it’s all about experimentation, and I’d love to hear what you come up with that works for you. I used Zote with washing soda and borax for laundry soap as I like the smell of it better than fels naptha, but it continues to thicken. It only takes 1 tbsp per load of clothes, so I add lots of hot water to it, it melts right away and is. Great for laundry. No suds however. Castile liquid is not used in laundry soap and doesn’t suds, but cleans really good! Tatally rinses out! 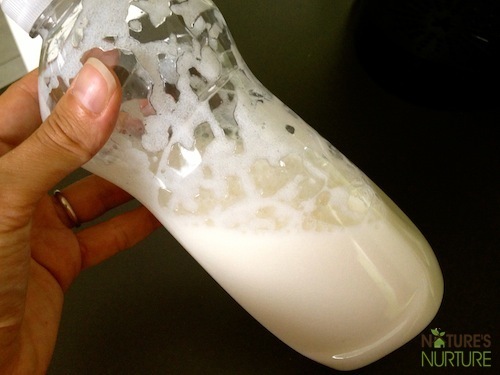 I can’t see that this will suds for dishes but will try it tomorrow! Glycerin is a thickening agent. It make give you a luxurious lather, but also thickens. Would glycerin bar soap be an acceptable substitute for the castile bar soap? I would totally try it and see if it works. I’ve seen people use homemade soaps and even regular store bought soaps like Ivory. So if all you have is glycerin soap, I’d give it a shot. Maybe make a smaller batch to test it out? I’d love to hear how it goes. Good luck! Sarah, I have a question. I’ve been trying to create a project involving edible soap, and this was the first site I went too to make the soap liquid (before this I made edible hand soap and figured out an edible alternative to washing soda). So, with the liquid castile soap, do you know an (edible) alternative? I’d be very interested to know what’s in your edible hand soap. I tried consulting with someone a few years ago to make edible “soap” (any kind of soaplike detergent). I knew actual soap soap wouldn’t work, so I tried the most digestion-friendly surfactant I could think of — sucrose laurate, related chemically to Olestra — but the result from swallowing 10 grams was diarrhea, as bad as or worse than a colonoscopy prep. (But the same is known to happen with Olestra if people eat too much of it.) And sucrose laurate cleaned only about half as well as Ivory soap on lampblack-stained cloth. AFAIK any surface-active agent you might swallow in amounts sufficient to clean with will do this — certainly actual soap will. Even bile salts — which enter your digestive tract from your gall, and can be used as detergent — will do this if you swallow them in significant amounts. So what are you using and how much at a time can someone actually eat of it without diarrhea? I made this but I read that washing soda is very alkaline and can burn the skin when I was trying to figure out if I could use washing soda to thinking body soap I made is this true. I would be a hassle to wear gloves every time to do dishes. Yes…washing soda is harsh on your hands…therefor I can’t use it. Why do you use both liquid and bar and not just one or the other? Curious how using just one over the other worked out? Hi Sara, thanks for the wonderful recipe.F inally found one that actually works. I’ve followed your recipe. It’s great, but it’s a little too slippery. Which ingredients should i reduce? I’m curious how using just one over the other worked out. If it’s too slippery, try reducing the washing soda a bit and see how that works. Glad you like the recipe! I just made this with only Kirk’s coconut soap bar, no liquid castile soap, and it seems to have worked. I doubled the recipe because I had already grated the whole bar. I added 20 drops of lemon essential oil and 2 tbsp of washing soda (and 2.5 cups of hot water). I washed some dishes with it and it seemed to be very nice to use. I will be happy if this works because even the natural dish soaps contain toxic ingredients, they seem to be pretty much a scam. I was previously using straight liquid castile soap made from olive oil, but the company, Val’s just stopped making it due to an inability to obtain olive oil. I don’t like using Dr. Bronner’s because it’s all hemp based and it’s estrogenic. Thank you for the recipe! Thanks for reporting back, Marilyn! How is this at cutting through grease? I’ve made homemade dish soap before and it was a bust. I really want to try this one if it works! Lori, it’s awesome! I know because I’ve also tried several recipes that just didn’t get the job done. This soap works just like regular store bought soap, even my mom is comfortable using it (which is saying a lot since it usually take a little longer for her to jump on the homemade train lol). 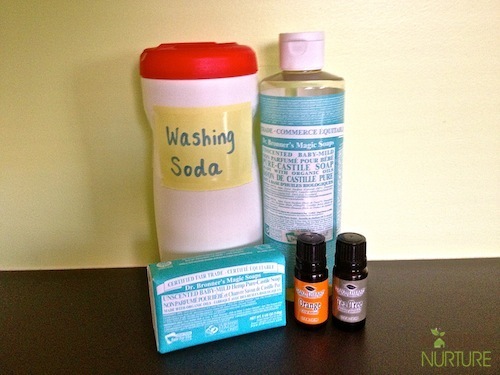 I have used this recipe and a few others as well as using straight Castile soap. Still have greasy dishes and spotted greasy silverware. I really would like a recipe that works but cannot find one. followed recipe as listed, no suds, greasy film on dishes and sink! bought foaming dispenser to try to get suds,if you put some suds on the sponge, and wash one item at a time, you have the suds, but still greasy film. If the castile bar soap and liquid castile soap , dr b’s, is expensive (which it is)…how is this saving money? I can get Bon Ami Natural dish soap for $3. for 25 oz. I love making homemade, but this is a lot for a little amount. What is the advantage here? well, the initial investment isn’t just for one batch of soap. you can get at least 5 batches from the dr. bronner’s bar soap, and you can use the liquid soap for other household things. (i used dr. bronners tea tree and hemp soap when my cats had fleas- i deposited the fleas in the soap and hot water mixture and it fdid them in right away.) and you can also use kirk’s coconut castile soap, which is much cheaper than dr. bronner’s. you may also be able to find dr. bronners online cheaper than in the store. for me, the advantage is knowing exactly what is in my soap. dr. bronners is an honest, trusted, natural company. i don’t trust big name brands that put out ‘natural’ products: the definition of natural is wide ranging and still contains chemicals. it’s worth the money and time investment to know exactly what’s in the products i use, plus it’s really fun to make stuff like this! I love bon ami powder. 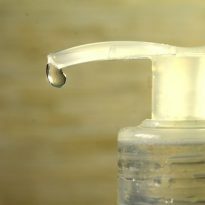 It is a safe affordable cleanser, but according to EWG (Environmental Working Group), Bon Ami dish soap is very dangerous to the environment and the skin. Just thought you should know. Actually, this soap recipe would be more natural than what you’re buying from Bon Ami.. because there’s actually ingredients in that supposed natural product that can cause allergic reactions and nerve damage! I actually cannot use products containing this or the other Methyl- chemical, because it makes my skin itch like crazy! Soooo, I would say it would be worth the investment! BTW Thanks for the recipe!! Thank you for your email expressing interest in the Bon Ami® cleaning products. We always appreciate consumer inquiries. All of our [domestic] liquid Bon Ami® cleaning products, including the Dish Soap, have been discontinued. These items were retired Summer 2014. The brand does enjoy a loyal following, but there simply wasn’t enough retailer or consumer interest in the liquids. In-store inventories are likely sold out, and we have no remaining inventory. We do continue to offer both of the powdered Bon Ami products. These may be purchased in-store or from our catalog affiliate @ http://www.agelong.com [1-800-892-8022]. If you are a Facebook user, you might consider adding Bon Ami to your “likes” on http://www.facebook.com/bonamiclean and you will receive info on your Facebook status feeds when we run new products, contests, or promotions. The Bon Ami® Baby Soap is exported to select overseas markets only. We do not offer this item to domestic [USA] accounts, and this SKU is not available for mail-order. We do apologize for any frustration or inconvenience. Again, thank you for taking the time to write. We sincerely appreciate your previous patronage. If you have future questions or product feedback, we are always happy to help.